Trying to dust off the cobwebs in this place! If you’ve been wondering why I’ve been a bit absent from posting here, it’s because I’ve been posting weekly over at A3C – where I host my own column titled, Act Like You’ve Been Here. However, I’m trying to keep a good flow of content in both places. Especially since most of my A3C content is business and hip hop specific. So, here we are! Now, I get a lot of questions on Twitter – and I do my best to answer each and everyone. Sometimes this leads to great conversations and messages that I’d like to share with others. Last week I asked for five questions that I can answer on my blog – and I had some really solid answers. So – keeping it short and sweet – here we go. @wtylerallen could you talk about ‘budgeting best practices’ — especially for brand new local/indie artists? I’ve spoken a bit on budgeting best practices here – but I’d gladly hash out some more info on budgeting. First and foremost, have a budget. Many of us just.. don’t. We have an idea of how much we’d like to spend, but we seem to overlook the details. For example, one aspect that’s left out of our industry discussions is seems to be ROI – which stands for return on investment. If you’re going to spend $1,000 on your album, then another $500 on marketing. How exactly are you looking to make back your ROI? That $1500? Do you have a roll-out plan? Will you be touring? If touring – will you be making enough to also cover touring expenses? Keep in mind – some things are hard to put an ROI on. It’s hard to put an ROI on PR, marketing and consulting. But these are still necessary marketing expenses, and the ROI isn’t as blurry if they have an expected long-term outcome. Blog placements that come with no social media or “story” angle. Don’t pay to play a performance, unless there’s a guaranteed chance for an ROI off of merch. Overly expensive Music Videos (visuals are great, but don’t sacrifice studio/marketing budgets for a visual ASAP). A publicist (only if ready) – or a pitch template/media list and do it yourself. Also look into very low cost submission services like Submithub. A quality EPK or – if interested – a booking agent that only takes a % rather than a fee. This will help you book your own gig, rather than paying for them. Twitter Ads instead of buying fake followers. @wtylerallen from your time in the industry what would you say is the BEST formula (if one in particular) for an artist to stay relevant? Relevancy in our industry relies on creating something unique and special with your fans. Not impressing labels, not finding A&Rs, not buying blog posts – but having a connection with fans. It used to be who could release the most music – but this was before there was social media. This was when radio/CDs were the only platforms. Now, you can talk to your fans and remain digitally on the scene 24-7 via social media. Ever notice how a brand – let’s say Starbucks or Coke, have a mix of social media content that’s part promotion, but then part just.. random tweets? Goofy memes, relevant articles – it gives consumers a well-rounded view of the brand. Both business and both personal. Imagine if they just posted about lattes and didn’t engage with their customers? Now, let’s make this about the music industry. Imagine if you just tweeted a song link – but didn’t show sides of yourself? Folks would lose interest. So, the first answer to this question is to simply remain active on social media, and have a good mix of content. Release new content and engage in discussions. But the second way is to stay on top of musical trends and stay in social discussions. A lot of folks hate on these younger rappers for not fitting their mold of “real hip hop”. But be aware that there’s something about this music that people are connecting to. Find it – and build off that. Don’t steal it, don’t become a clone – but study other artist’s come ups and see what you can emulate for yourself. 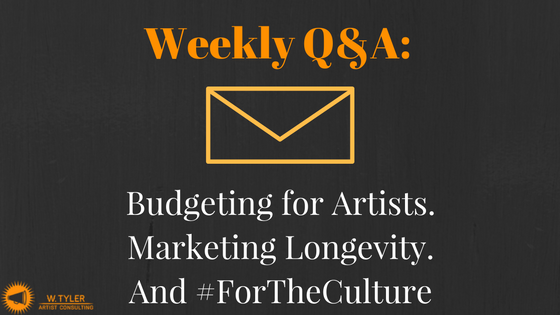 Good question – especially as we’re a few days away from A3C Conference + Festival. Events like A3C and SXSW always stun me because – there’s literally a conference going on. Most artists forget that they perform at night, but during the day – there’s a full-blown conference going down. A building full of journalists, label execs, publicists, managers, music supervisors. Usually giving panel talks geared towards artists. But what do most artists do? Most pass out CDs on the corner, or they just hope the “right person” walks into their showcase. But – yo, just walk across the street and go into the conference (if you have tickets)! Invite those people to your show! So, the first is be aware of your opportunities. There’s a good dozen or so music industry conferences in the United States, but there’s also workshops put on by PROs like SESAC, BMI and ASCAP. There’s also organizations like NARIP and Grammy U that are great for artists. However – I’ve met 90% of all my industry connections through LinkedIn and Twitter. As long as you approach people professionally, our industry is pretty receptive. Of course – if you call someone asking for quick advice but you’re really trying to get a blog post, booking or business need, it becomes obvious. Be up front if you want business, but also ask questions and just network with folks. Search people on LinkedIn find them on Twitter, engage, but engage like a real human rather than a robot. Absolutely! It’s especially vital as most labels or even publicists, expect an artist to already be developed before they do business. Remember, a record deal is an investment. You need to be (somewhat) developed before a label wants to take an investment in you. Even fans expect a narrative from day one, right? They expect you to have a brand – because you already have a platform via social media. 10-15 years ago, a label would “brand” an artist – but with the onslaught of social media outlets, you kind of have to come through with some form of personality and branding, because you have a 24-7 feed to your fanbase. Will a publicist help tweak your message? Yes. Will a label help develop a message? Yes. But before you even get to those steps you have to have a special “something” – so, you need to define what that is from the jump. This will and should evolve, change – but today development is more about fan development. Making sure fans know you and hear you, over all the noise of the other artists out there, vying for the same spotlight. In terms of longevity – development is especially important. Because you need to build superfans to maintain longevity. How do you think these older 90’s artists are still doing it? They created superans who still ride for them after all these years. Longevity and development also go hand-in-hand because an artist needs to understand some business moves – branding, contracts, publishing – to be truly successful in our industry. @wtylerallen (cont) also, I see u giving lots of gems on the daily. It seems your passion is #ForTheCulture, what does it mean to you? Music and assisting artists is my passion – and it comes from not only my major label and indie backgrounds – but also downright painful experiences of watching artists and promising labels go broke paying for shows and just making bad business moves. Hip hop absolutely has an entire culture surrounding it – however – what’s it matter if we aren’t helping one another? What’s “the culture” matter – if hip hop promoters are charging hip hop artists $500+ to perform their own work? What’s “the culture” matter – if hip hop journalists are charging artists to have their work featured on some backpage of a blog? Which only waters down the meaning of blog placements to begin with? What’s “the culture” matter – if we aren’t introducing our peers to solid booking agents, good managers, and reputable writers? The culture is a beautiful thing when it works – when DJs, writers, artists, venues and managers all come together – however, the culture can also be a way to take advantage of hungry artists. So to me – the culture is an incredibly powerful force, that I’m hoping one day we figure out. Thanks for the questions! If you have any you’d like to throw my way hit me at: @WTylerAllen on Twitter!